Should you have one in your blacksmith shop? The Engine Lathe is a common manually operated metal turning lathe. The standard lathe has a stepped pulley or gear box for different spindle speeds, gears to drive the carriage which supports the cutting tools and a tailstock to support long work and to drill holes in work supported in the spindle. 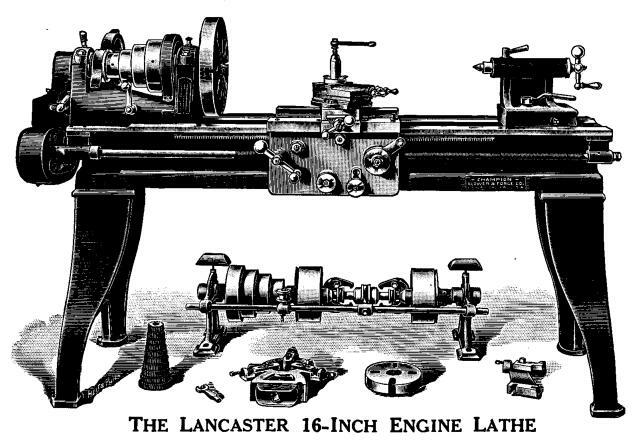 Engine Lathes were VERY common in blacksmith shops during the 19th and 20th centuries and still SHOULD BE today. The 1916 Sears Blacksmith and Farrier Tools catalog had more lathes than any other tool or machine including forges and anvils! The image below is from a 1920 Champion Blower and Forge catalog. There is no more useful machine tool than the Engine Lathe. It has been said that the Engine Lathe is the only machine that can reproduce itself and this is very nearly true. All the shafts and pullys of a lathe can be reproduced on the same machine. Many of the other parts can be squared up, bored and threads chased. It is even possible (though very inefficient) to make gears on a lathe. A lathe can be used to drill and bore holes, square blocks, machine dies, make parts (pins, bushings and shafts) for tools and machines, make large and small tenons, spin sheet metal. The modern blacksmith shop is full of machinery that are often old antiques that need replacement parts made and an Engine Lathe is THE TOOL to do it with. Twisting small stock (1/8" and 3/16") and wire. Old lathes can often be bought relatively inexpensively. Southbend Lathes: Southbend made fairly decent lathes. They ranged from the early flat belt drive machines to the heavy 16" tool room lathes that were found in many high schools. I have a little 6" Craftsman lathe from 1950, a 13" long bed 1936 Southbend and a 14" Porter from around 1899. Dave Baker turning power hammer parts on the guru's 60 year old 6" Craftsman Lathe. For small work the small lathe is more convenient than the larger lathe. However, if the work is bigger than 3/4" the larger lathe is much more efficient and does a better job. There are no parts available and very few tools available for these lathes. Lathes either came with quick change gear boxes or did not. Forget chasing threads if it did not. Usually you can find some other way in the time it takes to setup change gears. If the lathe does not have a QC box then be sure it has the stack of change gears and bushings that came with it. The important thing about old lathes is that they have all the standard attachments. These normally came with or were purchased with the lathe as a minimum. The first group comes with the lathe. The second were often bundled with the lathe OR should have been purchased by the original owner. They make the lathe efficient and enjoyable to use. They are the minimum for serious general use. Of the last group the milling attachment is practically worthless unless the lathe is heavy and in good shape. The taper attachment is VERY handy. Wood turning centers are not necessary to do wood turning but are helpful. The bull center is needed for tubing and pipe turning. I manufactured one for my 6" lathe from a standard size live center. The advantage of buying an old lathe is that it SHOULD come with the tooling. However, it is common for machinery dealers to buy old machines and sell the tooling off separately because much of it works with later model machines. Thus there are lots of old machines around that are missing even the change gears and face plate that were PART OF THE LATHE! I have also run into folks having lost one of the jaws from on of the sets for a three jaw (scroll) chuck. There are no replacements and making one is nearly impossible. This makes the chuck nearly worthless. You can purchase new chucks to fit old lathes but one chuck will likely cost more than what you paid for the lathe. Machine tools without the furniture or attachments are a pain to use and not very useful. When I setup old machines I will go to the expense to buy chucks, tool holders and various pieces costing much more than the original tool in order to make it useful. It makes a HUGE difference. See my iForge demo on Drill Press Furniture for an example of tooling you can make in the blacksmith shop. I have similar bolts and clamps for use with my lathe faceplates. So, look close, take inventory. It may be a good deal OR may be a money pit. If you are unfamiliar with the tooling I have named or what it is for then get a book on machine work and study it before looking at used machinery. Combination Square with protractor and center head. How-to Booklet from Starrett or Brown & Sharpe. There are many more precision tools, gauges, calipers and sets of micrometers going up to many feet in capacity, height gauges to use on a precision flat (cast iron or granite), and many more. But all you NEED for 99% of what you do is a good first class dial caliper that measures in thousandths of an inch (.025mm). I recommend you buy a good stainless dial caliper with covered rack NEW. The rest of your precision tools you can pick up as they become available or when you need (or can afford) them. Note that you don't need these tools only for a lathe. You need them to do any kind of precision layout, measure parts, identify drill bits, determine the thikness of sheet metal and use with other machinery that you may obtain. Old Lathes, Bed Wear: One of the biggest problems with old lathes is bed wear near the chuck. Heavily used lathes are used here more than anywhere else and the beds tend to wear if not kept VERY clean and well oiled. The result is that work almost always tapers when machined near the chuck. This may or may not be a problem depending on your use but it is a pain if you make any kind of small precision parts (shafts, pins, bushings). This is not repairable except at very high cost. Old Lathes, Tailstock Wear: Due to the small surface area under the tailstock they often wear. I have seen as much as .015" on a tool room Southbend. Always check your tailstock at the chuck (center to center) and with a test bar (see the Southbend - "How to Run a Lathe" book). To adjust the tailstock vertically requires shims. You disassemble the tailstock at the base to body joint and make shims to fit. Wear always shortens the tailstock so new shims are required. Do this FIRST before adjusting right/left. Old Lathes, Lead Screw Wear: Some cheaper lathes use the lead screw to drive the carriage same as threading. The result can be a worn out lead screw. This is expensive and difficult to replace so are best avoided. Most lathes drive the carriage for general work via the keyway in the lead screw or a separate shaft and the threads RARELY wear. Old Lathes, Compound Rest: This is one of the weakest parts on a lathe. Where the tooling slot crosses the dovetail it is often only 1/16" thick. Always be careful to adjust the position of the cross slide and the compound so that it has as much support as possible. Old Lathes, Available Tools: You can still purchase Armstrong tool holders from '00' size like my 6" Craftsman uses up to holders that take two men to lift. Although the clunky square tooling blocks have become popular they were designed for carbide tooling and do not have nearly the flexibility of use as the old standard tool post and tool holders which I much prefer. However, for boring, the heavy blocks ARE better. I made one specifically for holding boring bars and nothing else. Centers: Most lathe centers have Morse taper shanks. However, you must note that larger Southbends and some other lathes require a special bushing to use a center in the head stock. Live centers are generally much better in the tail stock and are often available in sets with interchangeable points. Often slipping drill chuck tapers damage the tailstock. Obtain a taper reamer to clean it up. Centers are commonly chewed up. They can easily be dressed in the lathe using a tool post grinder. An inexpensive tool post grinder for small work can be made using a tool holder for a die grinder or a Dremel tool. Chucks are still made with threaded back plates. However, there were no "standard" spindle nose threads so most are sold with un-threaded adaptors. These are normally threaded to fit on the lathe they are to be used on. Buck makes a WONDERFUL 6 jaw chuck that is easy on the work and can grip thin wall tubes tightly without distortion. Back gears are standard parts available from Boston Gear and others. However, they are NOT inexpensive. That stack of gears and bushings that came with a 12" lathe can easily cost over $1500 new. Old Lathes, Tools You Make: I have made a variety of tools for my lathes. Many are blacksmithy in nature. These have included micrometer carriage stops, cross slide stops, boring bars, friction cutting plates, arbors and double bit tool holders (the square holes hot drifted). I have seen shop built steady rests and taper attachments. A surprising number of tools for your lathe can be made ON THE LATHE. My Southbend had a broken reversing lever body when I got it. This relatively complicated part was replaced with a weldment that was machined on the lathe that required it! However, the special gears that went with it had to be made by a local machine shop at a cost of $300 in 1980. Lathes are great tools and deserve their King of Machine Tools title. EVERY metal working shop of any size should have one or more. The four basic types of lathe chucks. The 4 jaw independent chuck. These are the least expensive chucks. Each stepped jaw is operated independently by a screw. This provides the ability to chuck square, rectangular, round and irregular work accurately using 2, 3 or all 4 jaws. However accurate chucking is a slow painstaking process requiring an indicator gauge and practice. The stepped jaws are reversible for clamping inside or outside as mixed combinations. The 3 or 6 jaw scroll chuck. These are operated by a key that moves all the jaws at once. A good true scroll chuck will clamp work accurately to within a few thousandths of an inch. They are fast and efficient to use but are not as accurate as a four jaw chuck can be. The jaws are NOT reversible. They come in two sets for clamping inside or outside. The 4 jaw combination chuck. These combine the features of a 4 jaw independent chuck and a scroll chuck. Each jaw may be adjusted independently but all are opened and closed simulteanously with a key. These are very handy for repetitive work on square, rectangular or irregular pieces. These common chucks work like a 3 jaw scroll chuck but are designed specifically to provide a long accurate grip on drill bits and round stock. On a lathe they are most commonly used for drilling from the tailstock but there are also special models that fit threaded lathe spindles to hold small round bar. A Lathe's size is defined by swing diameter and distance (length) center to center. A center is a part with a taper such as a Morse taper on one end and a 60° point on the other. A lathe normally comes with two centers, one to fit the spindle and one to fit the tailstock. Center to Center is measured with a standard 60° dead centers in the spindle and in the tailstock with it pushed all the way back but not overhanging the ways. It is the distance from point to point or possibly a quarter inch (8mm) longer for engagement of the center points in a shaft or mandrel. This could vary somewhat according to the centers used but most made on Morse tapers are pretty standard. Note that on some lathes with large diameter spindle holes that a special bushing is required to use the Morse taper center in the spindle. This is part of the standard equipment. Swing is the diameter from the center of the spindle to the nearest obstructing point on the ways. Normally the the carriage wings are outside of this or roughly the same. The diameter that will fit over the carriage is considerably less but is not normally given. It is good to know. Spindle Bore is also given when the lathe has a hollow spindle. This is usually the actual size and work that size may not fit. Spindle Tapers and the headstock thread or mounting type (cam lock) are also a part of the lathe specifications. Tapers are normally Morse as they are the most standard in the industry. Threaded spindle noses were the standard for over a century but modern cam locking systems have replaced screw on chucks and face plates. Other features may be part of the lathe specifications but the above are the normal dimensional information used to describe a lathe. TRUE STORY: My friend Josh Greenwood had a job making nearly a mile of railing that was to be standard joinery using tenon joints on all the pickets. This required some 10,000 pickets and 20,000 tenons all identical. Although he could forge the tenons quite well he needed to put this job on other less skilled workers. I setup an old lathe he had with a 4 jaw scroll chuck and showed him how a 1/2" tenon on 3/4" square could be machined in one pass in about 30 seconds from picking up the bar to removing it from the lathe. The advantages of machining the tenons were precision size, square corners, equal length between shoulders and it was faster than forging and a worker with 15 minutes training could make them. 57,000 pounds of pickets! Saved his hide. Those of you that have visited Bill Epps shop when he was in Texas saw that besides two power hammers he had a lathe and a milling machine. 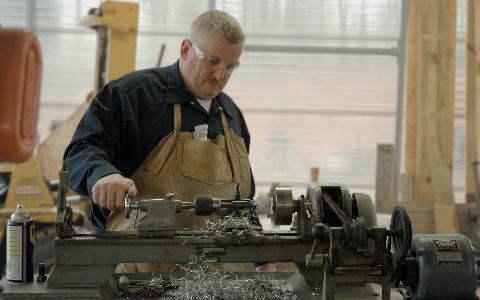 If you have seen Donald Streeter's book Professional Smithing he was using an arbor press for various purposes. And even though he was trying to show that the smith could make his own punches and dies by hand (you can) he had a machine shop seperate from his blacksmith shop that had lathes and milling machines. Anyone that visited the old Williamsburg blacksmith shop before Peter Ross would have noticed that any time they needed a hole drilled the smith would dissapear into the back and you could hear the whirring of a small motor. . . Today they have a purely 18th century shop but they also have a seperate shop with a power hammer and various modern machine tools. If you look at the many blacksmith shop photos on the Gill Fahrenwald calendars you will see machines of all types in the background. Even before the engine lathe became the flexible tool that it is today it had a place in almost every sizable shop since the 18th century. Lathe Setup What to do if you have missing drive parts. Rifling Machine by Maj. J.G. Smithley - 1944. How-to Run a Lathe, Southbend Lathe Company.